The Winner of my Garden Basket is Lauren J. Thanks everyone for entering. Sign up for my email list so you’ll be sure to know about my next contest! From April 8th- 17th you can win an e-reader of your choice or a $25 ebook giftcard by participating in the Authors In Bloom Garden Hop! In order to qualify, you must visit each participating author’s site (listed at the end of this post) and leave a comment, then enter the rafflecopter on Dianne Venetta’s site. Speaking of gardens, I’d like to announce my New Release – Mary, Mary. Raven Birchfield has moved into her deceased eccentric aunt’s house with her mother and younger brother. 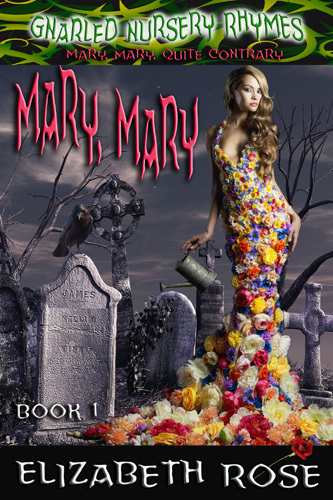 While planting a flower in her overgrown yard for her high school horticulture class, she hears a voice calling out the name Mary from a nearby graveyard. And when she uncovers an old book of nursery rhymes in the ground as well as a crystal necklace, her life takes a wicked twist. Nursery rhymes are really about past events in history and most of them are very horrid. So when Raven gets pulled into the body of Mary, Mary, Quite Contrary, she not only enters Mary’s world but can hear Mary’s psychopathic thoughts that are taking control of her own mind and filtering into her everyday life at school. Can Raven fight temptation when her heartthrob Dex Campbell has finally taken notice of her, or will she turn to Mary’s wicked ways instead? This is the first of my Gnarled Nursery Rhymes Young Adult Series – a book that can be enjoyed by any age. It is also a Golden Palm Contest Finalist! Get a copy of Mary, Mary, for free through April 10th, or for only 99 cents afterwards. And watch for Muffet – Book 2, coming soon! Gardening Tip: I love to garden and would love to share a tip with you that has worked wonderfully for me. Adding coffee grounds to your compost or around your plants will give them a boost. You can strengthen your roses, add blue color to your hydrangeas, and get rid of garden pests like slugs by putting a ring of coffee grounds around the plant. Try it! 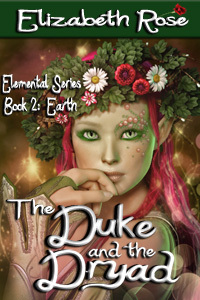 Another of my books that has to do with gardening is The Duke and the Dryad: Book 2 – Earth, from my Elemental Series. Rae-Nyst is an elemental of the earth and can control nature – but not Duke the Destroyer who threatens everything she believes in. 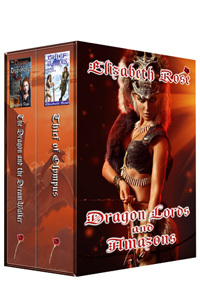 I’d also like to announce the release of my new paranormal boxed set Dragon Lords and Amazons. This book features The Dragon and the DreamWalker: Book 1 – Fire, from my Elemental Series and Thief of Olympus from my Greek Myth Fantasy Series. For a limited time you can get this boxed set for only 99 cents! Along with the Authors in Bloom contest, I am having a contest of my own. I am offering a prize of a gardening basket that includes a signed print copy of my small town contemporary romance, Doubting Thomas from my Tarnished Saints Series. Since I mentioned coffee earlier in my gardening tip, it also includes a $10 Starbucks giftcard, as well as a basket full of fun things you can use in your garden. Enter through the rafflecopter below. Watch my booktrailer videos from The Elemental Series and my Greek Myth Series. After the booktrailers you’ll find the links to the author sites for the Authors in Bloom contest. Enjoy this nice spring weather and get out to your garden to find peace of mind. This entry was posted in Contemporary Romance, contest, Free book, Medieval Romance, New release, Print Books, Uncategorized and tagged author hop, Contest and prizes, FREE book, Medieval Boxed Set, new release, young adult by Lizrosek. Bookmark the permalink. Brandi, yes having warm weather and no super windy days sounds nice to me too. Thanks for stopping by! Thanks for the hop. I get introduced to a lot of authors I have yet to read. Thanks for stopping by, Joye! The Hop is a great way to learn about authors one hasn’t read yet. I agree Bonnie! And lots of authors in the hop to check out. Air so I could breathe easier during the heat an humidity of the Summer. I would control earth so I could stop natural disasters! Thanks for leaving a post, Kim! omg, can I just say I want to wear that flower dress??? Way better than Lady Gaga’s meat dress! omg, you need to look it up. it was nuts. Shannon, most people seem to want to control air. It’s popular. Smile. I’d control the Earth and try make it bloom quickly for beautiful flowers and springtime! I would want to control the earth. I love nature and would love to be able to be a steward for mother nature. Is it weird that I don’t want to be an element? I’d rather not try to control or alter nature. She does a pretty awesome job all by herself. Not weird at all. Just another thing to do, huh? I would like to be able to control water because it is necessary for all life. Thanks for the wonderful giveaway! I’m glad to see someone chose water. Thanks for entering the contest! air.i like it when theres wind but not like today.way too windy i had to retrieve our recycling bin from out in the field. Angela, thanks for stopping by and leaving a comment! the trailers are really awesome. your gardening tip is really cool. Thanks for participating in the hop! Water. I love the way water feels on my skin. There is a freedom and it can be very peaceful. Melody, I agree with you. Thanks for commenting! Air, because air currents can control weather patterns and can move water and earth. Water. Hope to be able to relieve some of the world’s drought. I`d love to control them all but I`ll pick Earth. I didnt know you could use coffee grounds. That will definitely help! Thanks! Coffee is good for more than just people. Our plants enjoy a cup once in a while too.